Welcome to Spring in Colorado. I was sitting at breakfast this morning, looking out the window, and the sky was spitting snow. It was just a little, but it was enough to make the air wet. Add that to 40 degree temps and it was pretty cold. I invited my friend Houston over to be scrappy and she brought her little guy over to play with the boys. They had a great time playing legos, kicking the soccer ball around outside, and having pizza for lunch. I must have tired myself out taking pictures yesterday…I didn’t take any today. And I’m not sure why I’m so tired, but I know I need to head to bed soon. *yawn* I’ll leave you with a pic I took a few days ago of my favorite shoes. 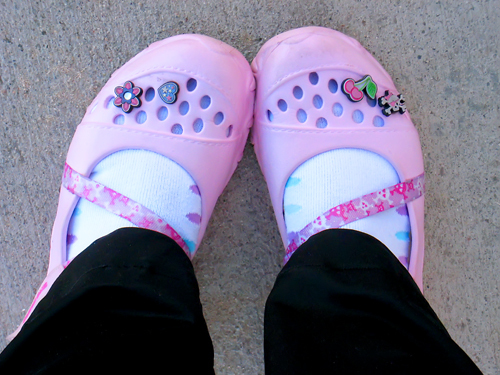 I thought I would never own any “croc-like” shoes…who knew…. Look at your cute feet! Glad you and Houston (and the boys) had fun! Cute shoes, as always! We had so much fun hanging out with you and the boys, thanks for having us over! I am totally lifting your chore cards this weekend, you are always full of good ideas! glad you found ways to amuse yourself indoors, the sun is finally coming out on our end — a day later. I have so many shots of my feet like this! but not really on purpose. sometimes my camera’s light sensor doesn’t work so I reset it by taking a photo of the ground. as a result I have soooo many photos of my feet. then I thought this is cool I’m going to document my feet in many places. so I did that for a while. then I was really sick for a few months and was running to bathrooms all over the greater metro denver area so I have a million cell phone photos of my feet in bathrooms. then I realized I was getting ridiculous and I should figure out something better to photograph. but ANYWAY I digress 🙂 cute shoes!